I’m a huge salad and soup lover! If you are new to my blog maybe you haven't noticed yet but even my button is a bowl of soup ;) Do you like mushroom??? Here is the recipe; Cream of Mushroom Soup on yonca is cooking. Whenever I make this soup, my family and friends love it. Hope you like it too! Sundays usually after a huge breakfast or early lunch, we have an early dinner. I prefer to cook soup and salad especially if we had alcohol drink one night before. Drinking can make it difficult to digest food and absorb vital nutrients. Mmmm...our bodies need soup and s a l a d !!! A bowl of warming soup is the best for comforting a stomack. Also a colorful salad helps filling your bodies with full of vitamins. Powerfull! Vitamin C speeds up the metabolism of the alcohol by the liver. So, your stomach will thank you!!! 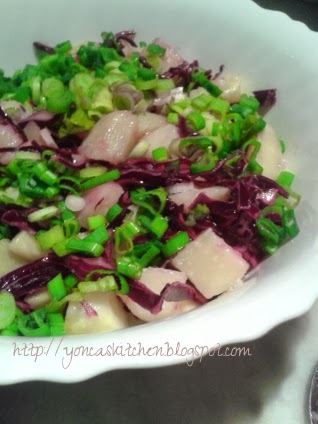 Here is a salad idea with red cabbage, rich source of Vitamin C and Vitamin E, is also cholesterol-lowering. I garnised it with a few olive on top after took the shot. When making this salad, cutting and tossing the veggies, dressing together, I feel like making an art! I am curious what your favorite salad is? ?